Contact Christ the Redeemer: Find below support details of Christ the Redeemer, Brazil, including phone and email. Besides contact details, the page also offers a brief overview of the tourist landmark. One of the most recognised statues in the world is that of Christ the Redeemer in Rio de Janeiro, Brazil. 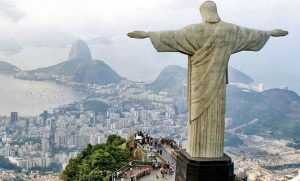 Christ with his arms outstretched, seeming to embrace the whole of mankind is revered by Christians the world over and is on the bucket list of almost all travellers to Brazil. Standing tall at 38 meters, Christ the Redeemer, was created by Paul Landowski, a French sculptor and is a collaboration of two people- Brazilian engineer Heitor da Silva Costa and French engineer Albert Caquot. The pristine look on the face of Christ is attributed to Romanian sculptor Gheorghe Leonida. Also known as Cristo Redentor in Portuguese, Christ the Redeemer is situated atop the Corcovado mountain in Rio and is fashioned out of soapstone. Visited by more than 3 million people each year, the statue was completed in 1931 and dedicated to Christ on 12th October of the year. Designated as a National Historic Heritage of Brazil in 2001, Christ the Redeemer attracts visitors from far and wide. It is an icon of Christianity across the world and is on the list of top cultural attractions of Rio de Janerio and Brazil. The statue has also made it to the list of New seven wonders of the world. In Art deco style, the statue of Christ the Redeemer is the world’s largest statue in the art deco style. At the base of the statue is a chapel that was built in 2006 to mark the 75th anniversary of Christ the Redeemer. You can visit the official website for more on the history or to enjoy an incredible 360d view of Rio de Janerio and the tourist landmark. Details on tickets as well as exclusive events held at the place are published online. Visitors can take the train to the summit and take in the breathtaking views from atop the Corcovado mountain and one can see the spectacular coastal view from atop the summit. Tickets cost R$ 61 for adults in.off season and R$ 74 in high season. Local residents can visit for a discounted price of R$ 48. The tickets can be bought online or from the counters at the entrance to the site. There are many ticketing sites that offer skip the line options for discounted rates that include the train ride to the top of Corcovado to the perch on which the statue rests. The busiest times are in the mornings from 9 am to 11 am and many visitors no opt for the less peak slots after 12 noon. For more information or queries on timings, events, tickets, parking, or others, reach the Christ the Redeemer support.